Previously on Glee... everyone important is in New York so don’t worry about the characters that are missing. We open Glee Season 5 Episode 15 with a truly lovely version of No One Is Alone and I don’t think I will be able to snark this episode at all. I wonder if the victim the vigil is being held for is a real person. I’m going to guess “yes," or else some poor actor’s biggest claim to fame will be “Used my headshot in the opening scene of Glee once." Silent title card! Yep, this is not going to be a light-hearted episode. Rachel needs time off from the show she is starring in for her Midwinter Critique at NYADA. Since even Awful Rachel understands that being in Funny Girl isn’t the break of a lifetime. Movies, girl. Get into movies. Or TV. I hear they pay pretty well. Sam and Mercedes pretend to discuss their relationship and then make out. Isn’t Mercedes supposed to be a super-successful songwriter? Aren’t there any employed people she can make out with instead? I’m relieved that the gay-bashing victim is alive. But I’ve also seen the preview for this episode so I realize this is not going to be the only attack. Mercedes and Sam pretend to discuss their relationship some more and then Mercedes throws her fur coat in the river. Because THAT’S what all those poor minks died for - a woman to be really cold while they float in the East River. You Make Me Feel Like A Natural Woman on the carousel is very cool, although, again, where are all the people gawking? That is not a deserted part of the city. I swear I'm going to NYC and stalking all the landmarks until I find Glee filming. Mercedes, your friends are VERY SMART. Listen to them. They should also tell you not to wear that hat. But mostly listen to them about Sam. Rachel is singing on a piano because of course she is. Right now Whoopi Goldberg is ruing the day she agreed to guest star. RUING IT. She fails Rachel and Blaine for doing a duet when the assignment was solo performances. That seems like a really, really stupid reason to fail. And THEN Awful Rachel wants special treatment because she is SO SPECIAL she can’t possibly just...sing a freaking song sometime in the next week? She quits I have to take back everything I said above about her being smart. Sigh. GIRL. Mercedes's friends play the race card and warn her the only people who will buy her album are albinos because she is dating a white guy. I mean, there are LOTS of reasons Sam is not a good match for her but I’m not sure “white” is the best one. Or that it would stop people from buying an album she doesn't actually have out yet. As long as she's not dating Justin Bieber I think she's OK.
RACHEL, LISTEN TO KURT. You’re awful, Rachel. But your hair is looking really, really gorgeous this episode so it’s distracting me. Kurt tries to break up an attack in an alley and gets beat up. It was extremely noble and heroic but also stupid. CALL THE POLICE. He is damn lucky no one shot him. Everyone gathers at Kurt’s bedside to hear he is going to be OK. No one is awful. Blaine is so sad I want to give him a hug. Of course seeing their friend in the hospital has caused some changes of heart. Mercedes sings Colour Blind (beautifully) to Sam to prove she isn’t not dating him because he’s white. They hug, which is inconclusive. Kurt’s dad comes to yell at him because those guys could have had a gun WHICH IS WHAT I JUST SAID. This is what happens when you’re a parent, you suddenly agree with all the grown-ups on teen shows. This is my favorite scene of the episode so far. I would watch Kurt's dad on his own show (although I still can't think of him as anyone but Jimmy from Yes, Dear because I am old). 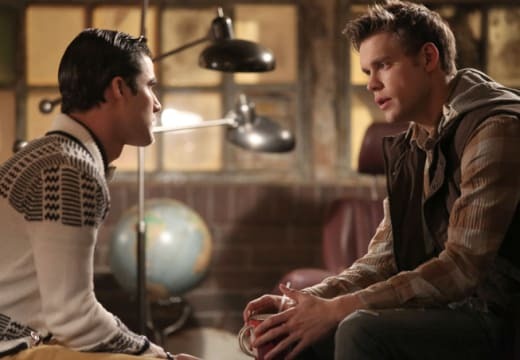 Kurt and Blaine go back to the makeshift memorial for the original attack victim. I thought when Blaine said “Are you sure you’re up for this?” they were going to look at mug shots or a sketch artist or something to try to catch the people who are doing the gay-bashing, but I guess putting flowers on the street is important too. Wrap up scene: Rachel is still dropping out of college. Sam and Mercedes announce they are officially dating. Everyone is excited about Kurt’s Midwinter Critique, for which he sings another old-style cheesetastic Broadway song. I mean, he KILLS IT, because he is Kurt. But let’s be honest, no one is buying this on iTunes right now. 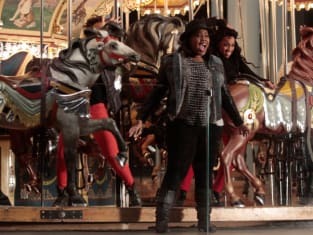 Next week on Glee: they’re going to sing Love Is A Battlefield and I am already way more excited about that than anything in this week’s episode. Poll time: Do you think Sam and Mercedes are a good couple? Yes! It's true love. No, it's never going to work out.